Last Monday, 60 members of MTB Eugene returned to the Eugene City Council to continue lobbying for mountain bike access to the newly-built Ribbon Trail. This was MTB Eugene‘s second time testifying before city council. This time, they came armed with more reasons why there should be more mountain biking trails in Eugene–including specific rebuttals to Neil BjÃ¶rklund’s letter in which he listed his reasons for closing the trail. 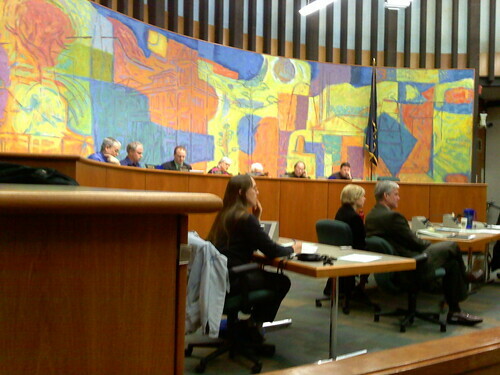 Unfortunately, this particular city council meeting was sort of ridiculous. The public testimony portion of the meeting ran for over an hour and a half: 42 different people testified on diverse topics like the West 11th EMX route, downtown homelessness, the new “no loitering” paint by the downtown bus station, and the two chicken limit in Eugene. The testimonies included aggressive poetry, a few hard-to-follow rants, and a live chicken. I rather enjoyed the entire thing, being a fan of circuses in general, but it was hard for the eight people testifying for MTB Eugene to stand out amongst the craziness. The recently-formed mountain bike advocacy group MTB Eugene is returning to the Eugene City Council on Monday, May 24th to lobby for the re-opening of the Ribbon Trail to cyclists. MTB Eugene, which was formed in response to the city’s decision to ban cyclists from the Ribbon Trail, has a goal to eventually open the entire Ridgeline trail system to bicyclists. The closing of the Ribbon Trail has proven to be the most popular subject on WeBikeEugene by far; this seems to indicate that mountain bikers in Eugene are a silent and suppressed majority. Indeed, Eugene (like Portland) has ridiculously little mountain bike trail access in relationship to its size and large bicycling populace. Much of this is due to a perceived conflict between mountain bikers and hikers, and the belief that mountain bikes damage trails more than hikers. Both of these beliefs have been shown in study after study after study after study to be false. Some studies have indicated that the real issue is the fear that hikers have of conflict with mountain bikers – a fear that for the most part exists only in hikers not exposed to mountain bikers. MTB Eugene’s testimony before city council on Monday will address a few of these issues, as well as other specific reasons that The Ribbon Trail should be re-opened to bikes. Go here for previous coverage of the closing of the Ribbon Trail and here for coverage and video of MTB Eugene’s previous testimony before City Council. Take the jump to read MTB Eugene’s full press release for the upcoming May 24th City Council Meeting. Leaders of local mountain bike club Disciples of Dirt (DoD) MTB Eugene plan to speak at Monday’s April 26th, Eugene City Council meeting in support of re-opening the Ribbon Trail to cyclists. They will urge the city to reconsider the recent decision, and would like as many cyclists in the audience as possible to help show support. This is a chance for Eugene’s splintered cycling factions to begin to unite and support each other on key advocacy issues. The group is meeting in front of the City Council Chambers (on Pearl Street between 7th and 8th) at 7pm to go over details, and then will enter together shortly before the meeting begins at 7:30. Attention Mountain Bikers and Trail Supporters!! In light of the City of Eugene’s recent decision to ban Mountain bikes from the Ribbon trail (the newest addition to the Ridgeline trail system) we are going to go to the Eugene City Council Meeting next Monday to let them know that we are disappointed in this decision. We will present numerous reasons why Mountain bikers should be allowed to share the use of this trail, as well as many of our other local trails. We hope to inform the City Council that this issue is important to many people, and educate them about how more mountain bike trails are consistent with the City’s stated goals and values. 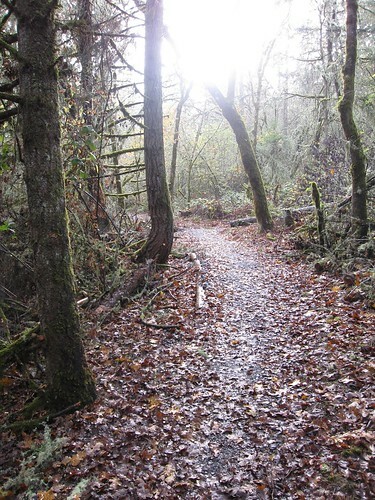 The letter also states that maintenance concerns and the trail’s proximity to Hendricks Park also factored in to the decision, but local advocates retort that the trail was designed with bike use in mind, and that these concerns do not warrant the closing of one of Eugene’s only mountain biking trails.